For starters this isn’t a review by any means but my mere take after experiencing the much awaited God of war. The latest installment has reinvented itself on the PS4 – the first ever native game for the platform and has done that for good. The sheer experience shows the fact that the games has no wonder taken well over 5 years to develop. The game’s a behemoth and it shows in every stage you pass by and packs some serious experience. First things first, the game still very well plays out in a linear fashion like the older installments but now opens up the world giving you that feel of a larger world around yet confining you where you need to be on this epic journey. In many ways I felt they have grounded the experience this time and it is probably due to how the character is portrayed and most important of all how the game is presented to you. Kratos feels more mature and all that brutality he has gone through in the past has made him even more tiring. He felt a lot more human (while he is still a god). To me personally the best part of the game – call it the best design choice is the Father- Son duo. It has given the game a different perspective altogether and has offered even a better experience than the earlier installments where you are always on this relentless rage and brutality. 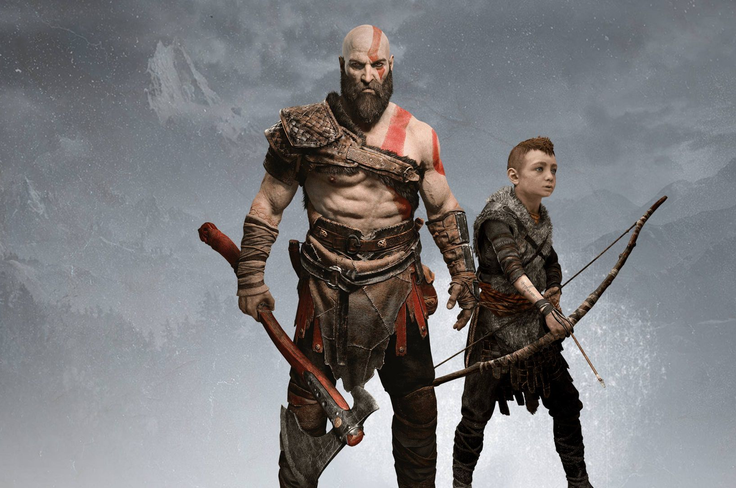 Kratos now cares for his son and he shows that at every step along. May be I related to it even better being a dad now. The battles play out very cleanly with the mechanics encouraging you to seek help and engage your son in the battles. The fact that you cannot take this journey or battle without Atreus really was striking. I enjoyed every single battle and boss fights where I keep asking him to shoot his magical arrows and when upgrading or leveling up, I was showing more care and attention to him. This is where I believe the designers have nailed it where they make you care about him and thus translating that feeling from Kratos onto you. In actuality Kratos isn’t a big deal without Atreus. In a lot of battles where you get cornered, he comes to your rescue. The games constantly carries this feeling over and makes it worse when Atreus falls sick and you are on your own for a while having to deal a bunch of fights yourself. I honestly hated that portion and again which the designers would have hoped the players to feel. This is exactly where God of War has managed to become more real and grounded. While it has its over the top moments and epic mythological battles, it does not simply feel like a hack and slash game anymore. The game now has even more life compared to the previous installments. I am sure they couldn’t have pulled this off on even a PS3 back in 2010. It’s almost like the stars had aligned this time for Santa Monica to craft such a narrative by choosing an alternate (Norse) mythological setting and taking the creative risk which has paid off by leaps and bounds. It only would have been possible on this console and even arriving this late into the console’s life cycle, it has only exceeded the expectations. In a lot of ways God of War plays like a dream, a video gamer’s wildest dream and throws everything at you to keep your Jaws dropped for hours together. I played this in our Studio’s in-house theater room on a large screen and surround sound, believe me I would have never enjoyed such a game to this level. I broke down the play sessions and was thus able to enjoy the game for nearly a week- almost making it a series like experience. Boy! Lets take em down! From the early impressions of the game, I had my reservations on the Axe as a main weapon in the game and so would have been many of the millions of fans. You are so used to Kratos’ blades and would have never expected the designers to give you a basic weapon like Axe -right ? But boy does it play like a charm! The weapon carried so much of weight and power and made that experience much more visceral! The recall feature like the Thor hammer is a great touch and has been married into the mechanics intuitively and lets you use it at every occasion. I simply kept doing that to beat a lot of bosses while I let my Boy to keep shooting arrows. 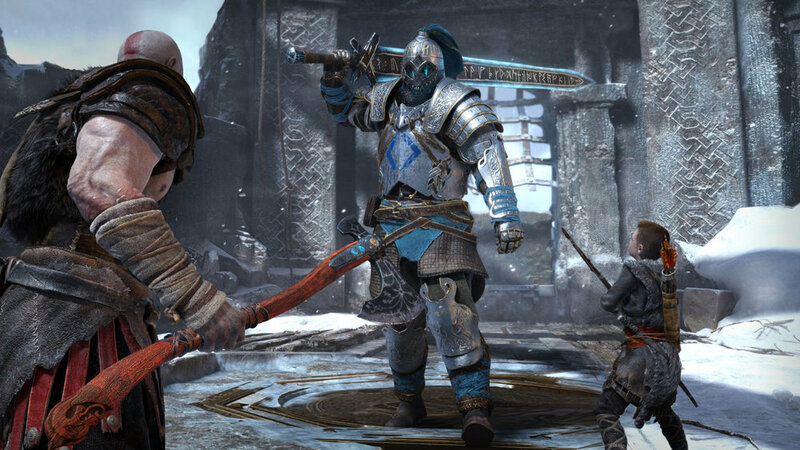 In all honesty I enjoyed the Axe more than the Blades (damn it I said Blades- yes they are there in the game!) and I felt so because it felt grounded and made Kratos feel even more stronger. It carried that weight and it can slice through enemies like a knife through butter. The clever use of Axe to freeze gears to navigate the levels, traps all played seamlessly. That Leviathan Axe simply felt magical! The game did a great job with serving the right kind of difficulty in what ever mode you chose to play and I was at medium. In a typical God of War fashion, the game starts off with a high note introducing a boss fight. The controls still felt a bit alien to me since this time around they moved to the shoulder buttons while departing from the classic square and triangle which now serve a different purpose. The game allows you to go through that learning curve for the first 30 mins or so after which you should do ok with enemies and the boss battles to come later. Of course the games puts you in these super hard junctures again like in a typical GOW fashion where you only fail a million times only to pick up the controller again cursing the boss and beating him this time. I had those moments in a bunch of battles, especially in that freeing hive section where you need to beat like a ton of enemies while marching your way through those narrow passages. But like you know I had my Boy! The developers sure seem to have spent a lot of time crafting the difficulty curve to near perfection. The game in a way gives you that much needed breather after you mow down a large bunch of enemies and it plays out in a brilliant manner. It’s like the game is reading your mind all the time and good game is supposed to do that. You want a high note, it gives it you, you now want to just explore and run around, it gives just that to you. No level or a juncture felt mundane or felt they were done for the heck of it. Games of this scale need to have those filler sections but GOW never seemed to have had those. Almost all the battles showed the sign of progress and accomplishment. The story of course felt giving you those twists and surprises one after the other but never raised questions on why would they do that. I wouldn’t lay any doubts that God of war is the best looking and best presented videos games of all time let alone on the PS4. Everything you see and traverse through is grand and crafted to detail. In a lot of the areas you would simply be ogling at the landscapes and the way the environment have been designed and lit. My mind kept saying- Man! How did they do that thing ? The scale of the game is simply unimaginable! I believe the real show stealer with graphics is the way the game is lit, it helped setting the mood and atmosphere. A lot of the lighting techniques the developers seem to have used in the game are beyond what is conventionally done in games. Nowhere in the game you would find a poorly designed level, no shadow issues, no odd lighting glitches. This is some next level of craftsmanship. Another key aspect that grabs attention and also in a subconscious manner is the game’s camera design. I was always a big fan of GOW’s original camera design from the older installments where game ensures the action is always depicted in a cinematic manner. There was even some fan outcry during the PS3 announcement that the game was still retaining the original camera design of fixed camera angles without giving the players control, given it was on Next-gen back then. Santa Monica also went on to justify and explain why they took that choice. For the new instalment they have went out of their way and dared to go with a single shot camera system that no game would remotely try. This single shot approach without any cuts brought the characters even more closer and established their journey in a much more intimate manner. Some of the in-game cinematic amaze you while seamlessly transitioning into gameplay. The last we saw such a similar treatment was from the Metal gear series but even there they never went on with the single shot approach of GOW. This coupled with the game’s zero loading put me at the edge of the seat all the time. The sound design of the game has been exceptionally done capturing every little detail and dynamics. The voice overs felt very natural and sounded aptly based on the environment you were in and never gave that dubbed in feel. The 3D audio and surround mix was spot on. You could hear an enemy approaching from behind accurately. From those loud grunts of a boss, to that thud when he lands his foot or the giant stone, it felt heart pounding! God of war is one of those rare games where narrative and the gameplay are so intricately bound together that it always puts you at the edge of the seat. A video game playing out a like a grand mythological movie is not an easy feat and Santa Monica has done one hell of a job. It is now one of those rare gems on Sony’s crown and is hard to be taken out by another game any soon! I came across a video from the creative director of the game, Cory Barlog where he broke into tears after seeing the Metacritic reviews.You will relate to that emotion more so after beating the game as the end credits roll (while you still play the game). It’s a game to cherish for many years and collect as a PS4 player. For those who are not on the system or claim to be one of those silly Xbox or PC Fanboys- do yourself a favor, borrow your friends system or even buy one to play the game. Its Priceless! Oh one more thing – that cut-scene after you reach your home – icing on the cake! Older PostYet another Mad rush to GDC!